30 Aug No questions on leadership of the Ovine nation. While there is plenty of conjecture in Canberra today as to who is leading the country, at least it’s clear in the livestock market. This week the leader remained the same, Heavy Lambs. In NSW in particular, where buyers paid over 900¢. That’s right, NSW Heavy Lambs this week averaged 910¢/kg cwt! With this price being the average, obviously half the Heavy Lambs in NSW made more than this. The National Heavy Lamb Indicator (Figure 1) is an extraordinary 271¢ higher than this time last year. And the price back then was pretty good too. The good news is that the weakening Aussie dollar continues to take the sting out of price rises in US and export market terms. Figure 2 shows the ESTLI in US¢ just tipping over 600¢. Still not as high as in 2011, and ‘only’ 27% above the same time last year. All sheep markets managed to gain ground this week. There is a bit of rain on the forecast, and spring is just around the corner in areas that have had rain. Perhaps demand for restocker lambs is on the improve. 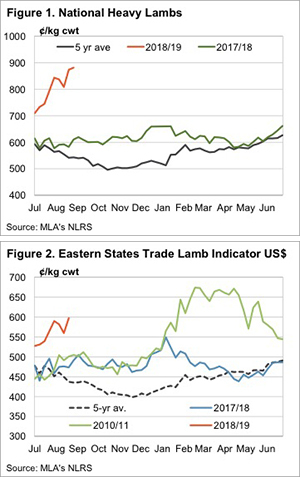 This week the east coast restocker lamb rallied 37¢ to 696¢/kg cwt. Mutton prices also had a marginal improvement, gaining 13¢ in the east, to 443¢. 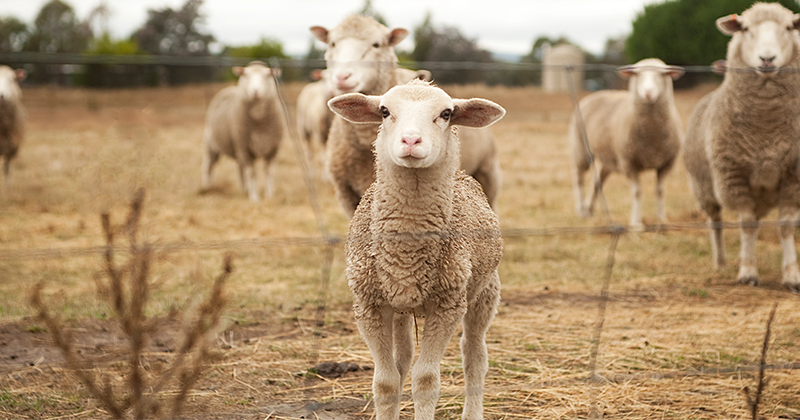 In the west, mutton eased 22¢ to 418¢/kg cwt. As noted last week, lamb prices in the west are well behind their east coast counterparts. Heavy lambs were up 50¢ and making 726¢/kg cwt. Not 900¢, but a very good price nonetheless. The forecast rainfall won’t see finished lamb supply increase in the short term. If it’s not followed up, it won’t see finished lamb supply increase at all. We are still at least 8 weeks away from sucker lambs from wetter areas hitting the market, so it’s hard to see lamb prices falling far in the short term. The forecast rain and some follow up, would make interesting times for mutton markets. It’s hard to see where the slaughter sheep would come from.